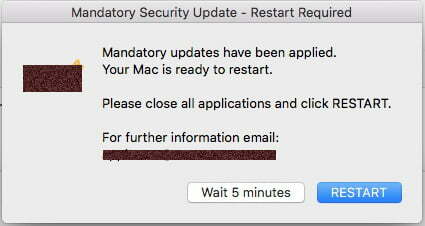 I needed a simple way to force Mac’s to run all updates from the Apple App store and then restart but give users notification and an option to defer for a set time. which will install all available updates. After completion it then has kicks off a dialogue box informing the user the Mac needs a restart. They have two options, defer for 5 minutes or restart straight away. or via a JAMF policy with a Process payload. Hopefully this will be more reliable that JAMF policies which either stay as pending or fail to restart the Mac even though set to Restart Imemdiately. do shell script "softwareupdate -i -a"